Coming into the season, senior Boulder City two-way softball star Charlie Masterson had hoped for a state tournament appearance to close out her storied prep career with the Lady Eagles. Today, the four-year starter will get her wish when the Lady Eagles take on Northern Nevada opponent Fernley. Following an early 6-1 loss May 11 to Faith Lutheran, the Lady Eagles’ chances of packing their bags for a trip to Reno looked slim at best heading into the loser’s bracket of the Division I-A Southern region tournament before a display of dominant pitching and timely hitting carried Boulder City to a remaining 3-1 record. They easily defeated Moapa Valley 8-1 May 12, starting their winning streak for the remainder of the playoffs. Using a four-run sixth inning against Sierra Vista, the Lady Eagles were able to escape Sierra Vista with a 6-5 victory on Friday afternoon to set up a rematch with Faith Lutheran, behind the bats of seniors Kylee Hamel (3-for-4, two runs batted in) and Bryanna Lopez (2-for-3, two RBIs). In a dominating effort by Masterson on the mound later that Friday night, the Lady Eagles pulled off a 5-2 victory over the Crusaders to capture the state tournament bid, behind seven solid innings in which she struck out four batters and allowed just two runs on nine hits. Boulder City will start its tournament off against Fernley (25-6-1) at 7 p.m. Friday as the No. 2 two seed from Southern Nevada at Shadow Mountain, in Sparks, Nevada. Having lost a heart breaker in the regional championship game to top seeded Spring Valley 3-2, the Lady Eagles will have to put their woes behind them early and focus on the task at hand. 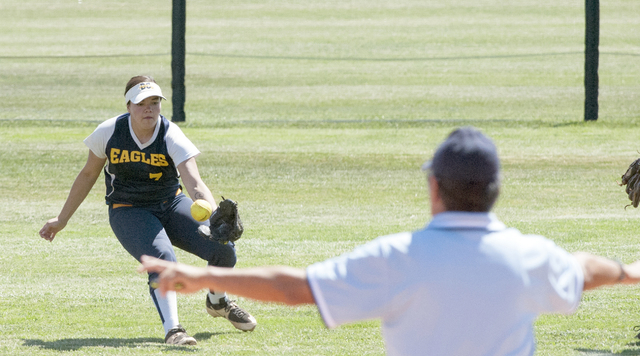 Tasked with hitting off arguably the best senior pitcher in the state in Grizzlies ace Michaela Hood, the Lady Eagles rallied with two seventh-inning runs against the University of Montana commit before running out of gas. Continuing a strong finish to her sophomore campaign, Lily Osman finished 1-for-3 in that outing with an RBI double against the Grizzlies despite the loss. If the Lady Eagles are to keep their season alive in Sparks, Osman, along with the bats of Masterson and sophomore Bailey Bennett-Jordan, will be a key reason why.